In the shadow of the great Himalayas lies the kingdom of Nepal, one of the most isolated and least developed countries of the world. In the quiet valleys, the people live unhurried lives with a rhythm that is governed by the calendar, rather than by the clock. In this remote kingdom, thousands of Buddhist and Hindu temples watch over the land, guarding the traditions, and preserving its ancient culture. For centuries, the Nepalese remain secluded in their mountain kingdom on the roof of the world. But in the last 20 years, Nepal's leaders have begun the task of modernizing the country. Development must come slowly, for modern technology could destroy a way of life that has endured for hundreds of years. The Nepalese realize that they must use caution if their nation is to find its way into the 20th century. Recently, Herbert W. Armstrong was invited to visit Nepal to discuss the problems of development with the king and government leaders. 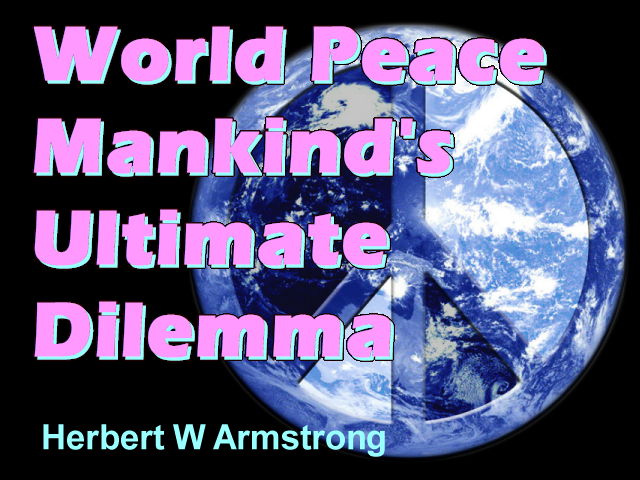 The World Tomorrow — the Worldwide Church of God presents Herbert W Armstrong... Internationally recognized Ambassador for world peace... Visiting prominent leaders around the globe... discussing the cause of world problems... and proclaiming the good news of the world tomorrow... ladies and gentlemen Herbert W Armstrong. It's known on this program that I frequently visit many heads of government in their countries, in all parts of the world. Now I meet them as president of the Ambassador International Cultural Foundation. This foundation is a corporate entity of the Worldwide Church of God, and it is devoted to opening up projects in cooperation with different countries, in their own countries, projects toward the development of their countries and toward world peace. My meetings in these countries enable me to speak before many of the leaders in these countries, not only the king or the prime minister, or the president, but also those who are leaders in these countries. And in so doing, I can explain why we do not have world peace. I can explain something that missionaries never can get over to the people in those countries, who do not know Jesus Christ or do not know the gospel. They're very much prejudiced against that sort of thing, and if I were a missionary, I would never be allowed to speak before these people. But the effective way is to speak to them in the manner in which I do, giving them the cause of world troubles, and telling them the way toward world peace, and the only way that world peace is ever going to come. Now I have known King Birenda for many years. I knew him when he was the crown prince. I knew his father, King Mahendra, before he died, and I recently paid another visit to King Birenda and his wife, the queen. Mr. Armstrong flew into the capital city of Nepal, Kathmandu, nestled in an expansive valley surrounded by the towering Himalayas. At Tribhuvan Airport, he was met by the foreign secretary, Bishwa Pradhan, and Major General Aditya Rana, aide-de-camp to the king. Next day, he visited Kathmandu's exhibition grounds, where Major General Rana had arranged a display of Nepal's development programs. Before a large relief map of the entire country, Major General Rana showed how Nepal's rugged terrain was a barrier to communication and development. Nepal has been called the prisoner of its own geography. Although only 54,000 square miles in area, about the size of Arkansas or Tennessee, it has some of the world's most varied and rugged terrain. Most of the 16 million population live in isolated valleys, cut off from their neighbors by the mountains and hills that cover most of the country. The first airplane did not land in Nepal until 1951, and it was several more years before the country was linked with its neighbors by road. Even today, as more roads are built, communication is difficult, and much of the country can still only be reached on foot. Never far away are the Himalayas, the highest mountains on Earth. These wastelands of ice and rock cover one-third of Nepal. Towering over them all is Mount Everest, at 29,028 feet, the highest point of the Earth's surface. But in spite of its isolation, Nepal has its share of problems. The population now about 16 million, is rising steadily. Nepal has one of the world's highest birthrates, and already 40% of the population is under the age of 14. Poor communications and lack of development trap most of the people in a life of poverty and illiteracy. They are subsistence farmers, conservative, tough, fiercely independent, and suspicious of change. Most belong to the Hindu or Buddhist faiths; their deep religious faith dominates the land. It has been said that there are more gods than humans, and more temples than houses. To visit Nepal is to step back into time, but the leaders of Nepal know that if their nation is to survive, it cannot remain a living museum. Nepal must be led cautiously into the 20th century. This is the challenge that faces the leaders of Nepal today. Nepal's head of state is His Majesty King Birendra Bir Bikram Shah Dev. He ascended the throne in 1972 upon the death of his father, King Mahendra, whom Mr. Armstrong had met the previous year. King Birendra is a progressive-minded monarch who is deeply concerned for his people's welfare. Mr. Armstrong was invited to visit His Majesty at the royal palace in Kathmandu. Upon his arrival, he was greeted by King Birendra and Queen Aishwarya. His Majesty and Mr. Armstrong discussed the purpose and the activities of Ambassador Foundation, as well as the special needs of the development and progress of Nepal. On the last evening in Kathmandu, Mr. Armstrong attended a banquet. The guests included members of the government and leading figures in the fields of education and commerce. After a program of traditional Nepalese singing and dancing, Mr. Armstrong was invited to explain to the guests the purpose of his travels as an ambassador for world peace. [Announcer:] I have the greatest honor to welcome him and say, "You are welcome to my country." They have called me an unofficial ambassador for world peace, and so I am, but let me say that there has to be a reason why we don't have peace. And you cannot have peace until there is something that will cause that peace. And there has to be a reason why something has caused us to have just the opposite of peace in this world today. And I'm afraid so many don't understand that. Now in the world today, there are many different ideologies and philosophies and religions, and everybody seems to think that their own, of course, is the right one, and the only one that is true and correct. And I did not come to bring any religion or philosophy or ideology, but just to state a few facts that are facts. We do not have peace, and will not have peace, until human nature has been changed. There has to be a reason why we don't have peace. The oldest history in the world, that goes back further in history of human beings on this Earth than any other, tells us that over all of the various gods that are worshipped in the world is one supreme creator God, that he created the first human being on this Earth. The man was offered immortal life, but he rejected it. Before him was the opportunity to choose good and evil for himself. The alternative was to choose to recognize his creator, to simply become one with his creator, until he would be dependent on his creator, and he would rely on this creator for the knowledge of how to live, of what is good, as well as what is evil. But this first man decided that he would just take to himself the knowledge of good and evil. He would decide for himself what is good and what is evil, and he rejected any reliance on his creator. And so he and his children soon forgot about the creator, and they have forgotten about him until this day. And so they formed many different nations. Now what he did take to himself was the knowledge of good and evil. And there is good in human nature, as well as evil, but even the human good can mount up only to the level of self-righteousness. I have often said that perhaps one of the best forms of good that we know in human life is mother love, the love that mother has for her child. But I wonder if we ever stop to think that even that love is selfish. She loves that child because it is hers; she bore it, and she doesn't love other children the same way. It is selfish, even though it is good, and the highest good that man has been able to have, except what he might have had as a gift from his creator, is self-righteous good — good within himself. Now we have a great deal of that in the world. We have in the world many upstanding people of high ideals, good principles, high morals, and they only want to do good. I want to do good. I am an unofficial ambassador for world peace, yes, but I have not brought world peace. And ladies and gentlemen, I am not going to bring world peace by myself. I can't change human nature. We do not have peace, because people are not living the way of peace. I know in our Western world, we have a world of awesome progress. We send men to the moon and back. We send unmanned spacecraft to the surface of Mars with cameras that photograph the surface of Mars and send those photographs back to the United States. But while we have a world of such awesome progress and inventing — the computers, airplanes, automobiles, and the marvelous things that we have today — at the same time in the world, we have appalling evils, with men and women jealous of one another, having an attitude and a spirit of competition one against another, selfishness. This first man started out on the selfish course that I like to simply state in such simple language that everybody can understand it. I say it is the philosophy of "get." There are just two broad philosophies in life, actually, in a broader sense. One I state as "get": take care of yourself and take away from others and get for yourself, selfishness; and the other is "give": cooperate, help, and be concerned for the good and the comforts and the pleasures and the welfare of others. And you don't see very much of that in the world, because most people are selfish. They're only concerned about their own self-good, and that is not the highest form of good when you're just concerned for your own self. And that is the kind of world that we live in. In this world, almost everything is run from a selfish point of view, and we need to get more generosity and wanting to help. Now I do try to do that. I try to help, I try to give, and try to cooperate. And you know, the greatest leader who ever lived said, "It is more blessed to give than to receive." And I found about 58 years ago that truth, that it does pay off, and it does make one more happy, if you are giving. I know that if a few of you plan something for the good of someone else, to surprise someone with something real good and real nice, and you work to make it possible and to present it to that person, and when you give it, you are happier to see him receive it than he is to receive it. Did you know that? It is better to give than to receive. And that's what we do in the Ambassador Foundation. We know that we are just poor humans. We're not able to solve all of humanity's problems. We want to help, we want to give, we want to cooperate, and I came here to do that. The first man rejected reliance on his creator, and direction from his creator. And the result is that his children born from him have grown now into many nations all over the world. They started out with three general types of races: the yellow, and the black, and the white. And there have been mixtures, and now we have different nations, all speaking different languages. And yet, all wars have come because of selfishness, and because human minds can't agree with other human minds, and there is conflict, conflict between one mind and other minds, in between one group and other groups, and between one nation and other nations. And so, we find that people go to war. And wars don't settle these things. They never have; they never will. Now I'm not going out to crusade and just stop all wars; I can't do that. I have enough sense to know that I can never do that. And there is no man on Earth who can. It is only the great Creator who can, and it's because we do not rely on the Creator for the knowledge of how to live, and how to do, and because we just look to ourselves, that we find we're helpless before our problems. The world does not know how to live, because it does not rely on the great Creator that is above all the gods, and above all that is worshipped, above all of the ideas of human beings. But most human beings know nothing of that God. I can just tell you that God is a god of love. He loves everybody on the Earth, and he is going to intervene in due time. And that time is going to be soon. He is going to let this world learn its lesson first. And this world is going to get into more trouble than it is in now. Instead of peace, we're going to have more wars than we have ever had, and we are soon going to have the nuclear war that could erase all human life from this Earth. And I say to you on the authority of that great God, that that war is definitely going to come. And unless that God does exist, the God who is supreme above all gods, and unless he does intervene and save all humanity from ourselves, all human life would be wiped out of existence and not a man, woman, or child would be left alive on the face of this Earth. But I say to you on his authority, that that great God is going to intervene. He is going to come and give us peace and save us from ourselves, because we humans would destroy ourselves. Human scientists have now invented, and governments have produced, the weapons of mass destruction that can erase all human life from this Earth. And the greatest scientists, and the greatest leaders in the world, acknowledge that once a nuclear war starts, it can never be stopped. And if it goes on, it would end all humanity, and that's the world you people are living in. But the great God is going to intervene. Now I'm not here to sell you on anything, or on any religion. I'm just here to tell you, and you are being told, that that God does love all of us in spite of ourselves, and in due time he will intervene, and he will give us all the truth. And those of us who think we have the truth and don't have it, are going to wake up and find the real truth after all. I'm not trying to convince anybody of anything, I'm just telling you. But I do speak with authority, and it will come to pass. As I was saying in Nepal, God Almighty will intervene in the coming nuclear war that would destroy all humanity. And at that time, he will send Jesus Christ to stop it, and to prevent the annihilation of human life, and to bring us world peace. Now I have a special booklet that I would like to send you, explaining about World Peace: How It Will Come, how the Eternal God is going to bring us world peace after we had learned our lesson. World Peace: How It Will Come. It will open your eyes. It will give you facts you don't realize that you have never known about the condition in the world, and how peace will come. Now in line with that, I have another booklet also touching on something I mentioned in this address in Nepal, on human nature: Did God Create Human Nature? How did we come to have human nature? That is a mystery that very few people have ever understood, and this book will open your eyes. It will absolutely open your eyes to something you never realized before — how we came to have human nature. Now there's no charge. We don't request money. There will be no follow-up, and no one's going to call on you, but you may have them by just telephoning and calling in, or by writing. And also, we will put you on the subscription list and give you a full year's subscription to the world's greatest magazine: The Plain Truth. With now well over seven million copies of circulation going out monthly, beautifully illustrated, The Plain Truth. And in this issue: How the United States is Looking Ahead. I have an editorial: What's Wrong With Business and Industry? Then there is another article: The Truth Behind America's Moral Crisis. Then another: The Family - God's Plan for Mankind. The human family, The Plain Truth is a family magazine, The Plain Truth is a news magazine giving you the meaning behind the world news so that you can understand what is happening in the world, and in world news. Here's another article: Do the Dead Know What the Living are Doing? It is not essentially a religious magazine, but there are articles such as that in it. Do the Dead Know What the Living are Doing? Now here's another one in general conditions of today: Canada's Troubled Economy. Here's another article in this recent issue: 1985 - Turning Point for the World's Economy? And then here is one: What's Prophesied for Russia and for China? That will open your eyes — what Bible prophecy says is going to happen to and with Russia and China. If you want to know what is next, what is going to happen next and what is prophesied, you will need The Plain Truth magazine. You'll have a year's subscription — no subscription price whatsoever, and we do not beg for money on the air. So you just send me your request: Herbert W. Armstrong, that's all the address you need, Pasadena, California. Herbert W. Armstrong, Pasadena, California, 91123. Or better yet, just go to the telephone right now and call this free call: 800-423-4444. Now you remember that very well, jot it down. If you don't get through right away, call again in 10 or 15 minutes. 800-423-4444. Thousands and thousands of calls are coming in, so stay with it until you get through. So until next time, this is Herbert W. Armstrong. Goodbye, friends.